I was recently at a dinner party of a friend’s and sat next to someone I had only briefly interacted with before, but was excited to talk to. That’s until I realized she only talked about herself. As soon as I came to this realization, I tried to engage others as soon as naturally possible. In these conversations, we shared our thoughts on shared interests and recommended books, TV shows, and films to one another. It was then that I realized how much more engaging and informative conversations that provided value were than those in which people only talked about themselves. I had never really thought about how this concept, which I understood applied to content creation, also applied to everyday conversations. 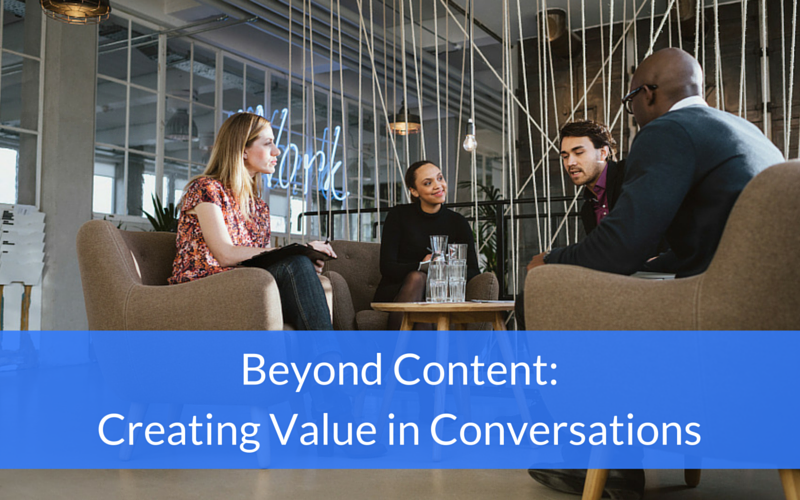 This led me to reflect on discussions I’d had with friends and clients in the past, and how this rule of “always creating value” can and should be applied to all conversations with both prospects and clients. Your best bet is to talk about what you know. It’s highly likely you know more about something than the person (or people) you’re talking to, especially when it comes to prospects just learning about your industry and/or what you offer. Instead of talking about yourself which, in this scenario, would entail only talking about your product or service, impart your knowledge of the industry and inform the prospect. In the content world we always talk about thought leadership and industry expertise, but content isn’t the only way we can share these things with the world. In fact, we should use every conversation we have with prospects to demonstrate how knowledgeable we are in the field, further underscoring why they should partner with us. With clients, we should continue to impart our wisdom every opportunity we get, thereby reinforcing their decision to hire us was a smart one. A friend of mine was launching a website for his small startup. He asked if I could look at the site after the launch to point out if there were any huge flaws or stuff he could improve. I made a few recommendations and gave my reasoning behind them, explaining that he didn’t want to partake in black hat SEO techniques (like keyword stuffing and buying links) and instead wanted to focus on white hat tactics, like including keywords naturally and earning backlinks. These are the kinds of conversations you need to be having with both prospects and clients. By asserting your expertise in the field, you’ll prove you know your stuff while generating and fostering trust. Ultimately, your clients deserve a knowledgeable partner, so if you don’t relay your competence in the field, they might start looking for it elsewhere.